Hawaiians are the most content people in the country. What can the rest of us learn from them? In my last book, The Descendants, the patriarch, a Honolulu attorney, takes a good look at his paradisiacal life and declares: “Paradise can go #!#% itself.” He obviously didn’t contribute to the Gallup Poll that each year determines that we Hawaii dwellers have the highest level of well-being of any state in the U.S. Indeed, “Lucky we live Hawaii” is a common sentiment (and hashtag). But are we as happy as the pollsters say? And if so, why? I can’t answer for everyone. But I will look at my family’s life over a few days and try to glean some answers. What is different about Hawaii? Sunday morning at our house on Oahu’s Windward Coast. We ask our two kids what they want to do. “Beach, I guess,” our 7-year-old daughter says. We head to Kailua Beach, about a five-minute drive away. We go to Kalamas, past the kitesurfers, and let our dog, Bob, off his leash. Sometimes we bring Bob’s bodyboard too—he catches waves to the delight of tourists—but today we’re just here for a little while. We run into my brother and sister-in-law and their three kids. Daphne just got off her shift—she’s a surgeon at Honolulu’s Queens hospital. The kids surf; I head off for a quick walk, intending to exercise, but end up bumping into friends. I socialize more than sweat, which is fine—it’s almost impossible to be on this beach without meeting someone you know. There’s a nice breeze and because of the expanse of the beach it’s not too crowded. Kids are digging holes like it’s their profession; their parents are drinking coffee and reading books. When I return, the kids are still surfing, my son is busy in the sand, and my close friend happens to have come down with her kids and a cooler of lunch and beer. We get home around 1, put our son down for a nap. In the afternoon, some friends stop by to swim in the pool and end up staying for dinner. We rummage through the fridge, find enough things to throw on the grill. Our friend runs home to get some just-caught mahimahi she bought off a fisherman coworker. We bring out the little firepit and roast marshmallows. Monday morning. I take on the carpool, grocery shop, work, clean the house. After school my daughter wants to hike Mt. Olomana. I oblige—I could use a walk. The mountain looms large in our lives: It composes the bulk of our view from the backyard. The hike up it is about a mile and a half, with an elevation gain of 1,643 feet. When you get to the top, you feel like you’re standing on a mere sliver of land. 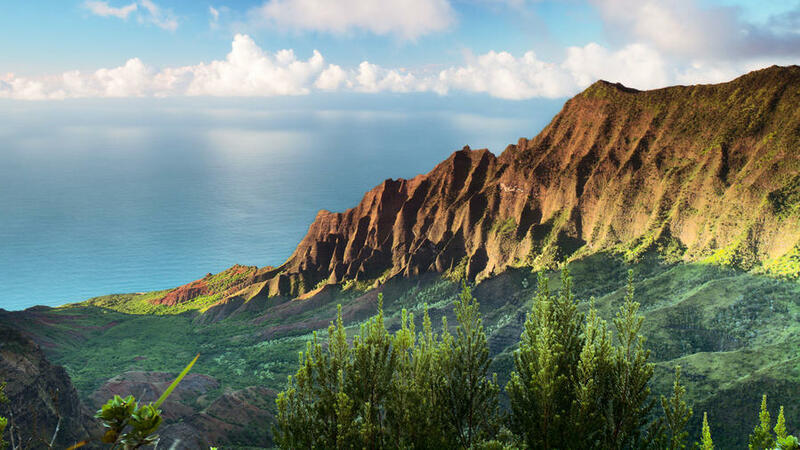 You can see the spectrum of Oahu—you’re overwhelmed by nature yet managing it in some way. The last stretch of this hike is difficult and dangerous. Often there’s a whir of helicopters rescuing the injured or the afraid. You need ropes to pull yourself up the last section. My daughter and I turn around at the first set of ropes. Tuesday. Even in Hawaii, not every day is bliss. My husband, originally from Wisconsin, is a Honolulu litigator with a grueling work schedule. His hour commute takes him over the Pali Highway, affording him views of the Windward Coast, and the sharp, sheer cliffs of the Ko‘olau mountains. At the top of the Pali Lookout, the wind is so strong your hair stands straight up. There’s a change in climate there, and a sense of history. The Pali is the site of the Battle of Nu‘uanu, where King Kamehameha conquered and united the chain of islands. The unfortunate losers were pushed off the cliff. But my husband doesn’t get to stop and ponder any of this, not on workdays. Instead, he comes home late after a day of downtown battles. Our son is asleep; I am exhausted from breaking up arguments, making dinner, getting my daughter to do her homework, thinking about my work, and debating whether to put my son in an extra day of day care even though it costs enough as it is. Sometimes paradise does nothing but shame us for not feeling like it’s enough. Sometimes it’s just the backdrop for a laborious show that must go on. On Wednesdays, school gets out at 1 p.m. My son naps at my mom’s so I can run into town to pick up my daughter. I take her to the bookstore to do homework and then out to Cromwell’s Cove, a spot on Diamond Head, which requires wading through the water, climbing over rocks, then walking around a point. I’ve never taken her here before and I haven’t been since my dad took me when I was 10 years old. The ocean splashes against the rocks, and she’s skeptical but I tell her it’s okay. Soon we reach the cove, which is directly below Doris Duke’s estate Shangri La. I point up to the beautifully tiled, exotic pool house. At the cove, some older boys are jumping off the 6-foot wall into the clear ocean below. She looks at their tattoos, interested since we recently went to the tattoo exhibition at the Honolulu Academy of Arts. She is ready to jump and we go at the same time. We rush home before nap is over. My husband returns from a trial on Maui. Some friends drop by to swim. Outdoor dinner, music, homework. Paradise regained. It’s true that days here typically involve socializing, family, help from family (lots of date nights), beautiful places that are easy to get to, physical activity, and recreation that’s totally free. There’s also a lot of spontaneity, which I think is common for those of us who live here—we make room for the unplanned. I understand. San Francisco was the same. It’s a beautiful city, but the best experiences required planning and time. As a parent, there seemed to be a set course of activities to choose from, kind of like circuit training, and I had the feeling after going from playground to playground each and every day, that I was missing something that was only available to certain people. I think what’s different, here in Hawaii, is that everyone can have paradise. No one is missing anything. We have equal ownership of the surf, the sand, the hiking trails, the sunsets, and it’s all near to all of us. We have shared experiences. Foodies and the just-plain hungry flock to food trucks and to “plate lunch.” There’s a melting pot not just of cultures but of economics. Judges, developers, carpet cleaners, cashiers—they’re all in the lineup at the Kewalo Basin surf spot before work. We lob around the term “aloha spirit” quite often. It’s an elusive phrase, but at heart I’d say it has to do with inclusiveness, and an ability to welcome spontaneity into one’s life. We are known for slack-key guitar, which is appropriate. It means to loosen the key, and that’s what we are able to do while maintaining busy, productive lives. This isn’t to be confused with dolce far niente: the Italian sensibility of pleasant idleness. It’s quite the opposite. We don’t lounge in the beauty—it beckons us to hike it, paddle it, surf its swells, snorkel its reefs. And it’s part of our jobs in some way, a responsibility to ourselves and our children to teach these lessons in free fun, in working with what we have, which becomes a true and endless appreciation. Yes, we have strife, traffic, arguments, and stressful days. Many of my friends amend this by surfing before work. Many amend with sunset cocktails. But I think we all feel, when we look at our lives, and see the people spending money to travel to explore what’s in our backyard, that we’ve gotten away with something. So, while our lives may be vastly different from one another’s, there’s this shared pride and affection for a place that’s inextricable from our selves, and a knowledge that this paradise is all ours. I think this makes us pretty happy. To see the island at its wildest and most rejuvenating, explore the rain forests and waterfalls of the Hamakua Coast, which runs northwest from Hilo to Waipio Valley. For fiery geological excitement, follow Danny Akaka’s lead and view Halema‘uma‘u Crater in Hawaii Volcanoes National Park. Café Il Mondo. Italy meets the Big Island—e.g., in macadamia nut pesto. $$; 45-3626A Mamane St., Honoka‘a; 808/775-7711. Volcano Art Center. The gallery is a go-to place for original works by top printmakers, woodworkers, and ceramicists. 866/967-7565. Kilauea Lodge & Restaurant. The lodge’s historic fireplace warms an eclectic dining experience that ranges from a German sausage plate to a local catch prepared Hawaiian-style with mango-chutney glaze and macadamia nuts. $$$; 19-3948 Old Volcano Rd., Volcano Village; 808/967-7366. If you think of Oahu only as home to Honolulu’s glittering hotels, the island’s more natural side will surprise you. But leeward Oahu carries you back to a sleepier, rural Hawaii. Frenetic Waikiki can be serene, once you experience it from the water. And Kaui Hart Hemmings’ Kailua neighborhood, on windward Oahu, has a pleasing small-town vibe, along with world-class beaches. He‘eia Kea Pier General Store & Deli. Locally sourced, fresh-tasting island favorites like guava chicken and ahi poke thrive in a somewhat unlikely setting. $; end of He‘eia Kea Small Boat Harbor, 46-499 Kamehameha Hwy., Ka-ne‘ohe; 808/235-2192. This is the rough side of Oahu: Occasional homeless camps and car break-ins deter some tourists. But the island’s west side enfolds sandy beaches, deep valleys, and dramatic mountains; you’ll find luxurious lodging options at Ko Olina, on the coast’s south end. Ka‘ena Point State Park. After a drab drive, inspiration awaits at little-visited, lifeguarded Yokohama Beach and along the moderately difficult 2.3-mile trail to scenic Ka‘ena Point Natural Area Reserve. End of Farrington Hwy., Ma-kua. Island Country Markets. This upscale deli offers good grilled panini and plate lunches, plus local foodstuffs such as apple bananas and Maui’s Roselani Tropics ice cream. $; 92-1048 Olani St., Kapolei; 808/671-2231. Kayak/paddle/surf Waikiki Beach. Activities, at Hilton Hawaiian Village, has kayaks for rent ($40/hour, $60/2 hours; 808/949-4321). For surfing and stand-up paddleboard lessons, contact Hans Hedemann Surf School (hhsurf.com). The Royal Hawaiian’s Azure Restaurant. It’s not inexpensive, but for ocean lovers, Azure offers both a beachside setting and some of the best seafood in Hawaii. $$$$; 808/921-4600. Along Kauai’s North Shore, natural beauty soars to the supernatural; on the northeast side, tiny Anahola is a reminder of the rhythms of traditional Hawaiian life. Stock up for a beach picnic by stopping at Duane’s Ono Char-Burger, in this sleepy little Hawaiian town where you’ll likely see wild chickens and might hear Hawaiian being spoken. $; between mileposts 13 and 14 on State 56; 808/822-9181. Makua Beach (Tunnels). Hard to park near, harder to leave—this sandy strand boasts ideal snorkeling in calm weather and cavern-laced reefs farther out for expert surfers and divers. Leave your car at Ha‘ena Beach Park (near milepost 9 on State 560) and walk a few hundred feet east; Ha‘ena. Mediterranean Gourmet. At Hanalei Colony Resort’s oceanfront restaurant, island greens and fresh fish add local flavor to a multiethnic menu that includes gluten-free options. $$$; 5-7132 State 560, Ha-‘ena; 808/826-9875. Molokai residents have fought for decades to keep development away from their 38-mile-long island. Sandy beaches line the west end, while the east end’s Halawa Valley shelters rain forest and waterfalls. On the south side stretches an immense barrier reef; on the north, the world’s highest sea cliffs isolate the former Kalaupapa leper colony, now a national historic park. Kualapu‘u Cookhouse. The menu notes, “If you’re in a hurry, you’re on the wrong island!” Most guests don’t mind the wait (or simple seating, BYOB, and cash-only policy) once the grilled fish and stir-fries arrive. $$$; 102 Farrington Rd., Kualapu‘u; 808/567-9655. Outpost Natural Foods. Organic-food fans rely on this grocery store’s kitchen counter for local-fruit smoothies and veggie bur­gers. $; 70 Makaena Place, Kaunakakai; 808/553-3377. The Magic Isle has its contradictions. Calm and lovely today, its ‘Iao Valley was where King Kamehameha I defeated Maui forces in his fight to unite Hawaii under his rule. Beach town Pa‘ia has two faces too: world-class surfer and windsurfer hangout, but also home to native Hawaiians whose island roots reach back centuries. Pa‘ia. Hana Highway drivers may notice only plantation-era buildings and modern hippies, but for water lovers, Pa‘ia is the North Shore destination, with beach parks for expert surfers and windsurfers (Ho‘okipa Beach Park) and bodyboarders (H.A. Baldwin Park and Pa-‘ia Bay). 7 miles east of Kahului, at milepost 9. Mana Foods. Pick up an organic breakfast burrito, picnic lunch, or dinner from the highly regarded deli counter and bakery at this health-foods institution. Gluten-free, vegan, and raw options abound, as well as more decadent pleasures like chocolate chip banana bread. $; 49 Baldwin Ave., Pa-‘ia; 808/579-8078.